On a clear night, and when light pollution isn’t a serious factor, looking up at the sky is a breathtaking experience. On occasions like these, it is easy to be blown away by the sheer number of stars out there. But of course, what we can see on any given night is merely a fraction of the number of stars that actually exist within our Galaxy. What is even more astounding is the notion that the majority of these stars have their own system of planets. For some time, astronomers have believed this to be the case, and ongoing research appears to confirm it. And this naturally raises the question, just how many planets are out there? In our galaxy alone, surely, there must be billions! To truly answer that question, we need to crunch some numbers and account for some assumptions. First, despite the discovery of thousands of extra-solar planets, the Solar System is still the only one that we have studied deeply. So it could be that ours possesses more star systems than others, or that our Sun has a fraction of the planets that other stars do. So let’s assume that the eight planets that exist within our Solar System (not taking into account Dwarf Planets, Centaurs, KBOs and other larger bodies) represent an average. The next step will be to multiply that number by the amount of stars that exist within the Milky Way. To be clear, the actual number of stars in the Milky Way is subject to some dispute. Essentially, astronomers are forced to make estimates due to the fact that we cannot view the Milky Way from the outside. 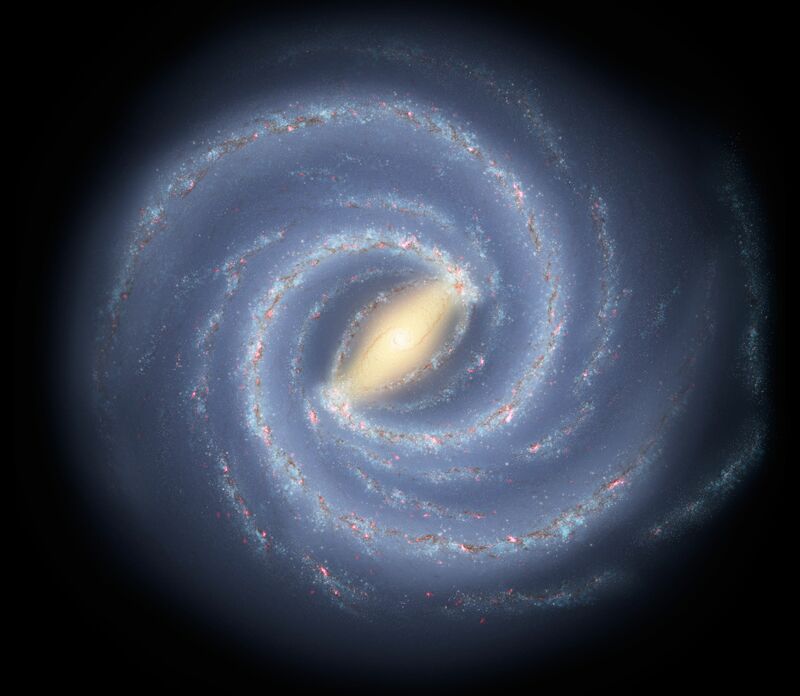 And given that the Milky Way is in the shape of a barred, spiral disc, it is difficult for us to see from one side to the other – thanks to light interference from its many stars. As a result, estimates of how many stars there are come down to calculations of our galaxy’s mass, and estimates of how much of that mass is made up of stars. Based on these calculations, scientists estimate that the Milky Way contains between 100 and 400 billion stars (though some think there could be as many as a trillion). Doing the math, we can then say that the Milky Way galaxy has – on average – between 800 billion and 3.2 trillion planets, with some estimates placing that number as high a 8 trillion! However, in order to determine just how many of them are habitable, we need to consider the number of exoplanets discovered so far for the sake of a sample analysis. As of October 13th, 2016, astronomers have confirmed the presence of 3,397 exoplanets from a list of 4,696 potential candidates (which were discovered between 2009 and 2015). Some of these planets have been observed directly, in a process known as direct imaging. However, the vast majority have been detected indirectly using the radial velocity or transit method. In the case of the former, the existence of planets is inferred based on the gravitational influence they have on their parent star. Essentially, astronomers measure how much the star moves back and forth to determine if it has a system of planets and how massive they are. In the case of the transit method, planets are detected when they pass directly in front of their star, causing it to dim. Here, size and mass are estimated based on the level of dimming. In the course of its mission, the Kepler mission has observed about 150,000 stars, which during its initial four year mission consisted primarily of M-class stars. Also known as red dwarfs, these low-mass, lower-luminosity stars are harder to observe than our own Sun. Since that time, Kepler has entered a new phase, also known as the K2 mission. During this phase, which began in November of 2013, Kepler has been shifting its focus to observe more in the way of K- and G-class stars – which are nearly as bright and hot as our Sun. According to a recent study from NASA Ames Research Center, Kepler found that about 24% of M-class stars may harbor potentially habitable, Earth-size planets (i.e. those that are smaller than 1.6 times the radius of Earth’s). Based upon the number of M-class stars in the galaxy, that alone represents about 10 billion potentially habitable, Earth-like worlds. Meanwhile, analyses of the K2 phase suggests that about one-quarter of the larger stars surveyed may also have Earth-size planet orbiting within their habitable zones. Taken together, the stars observed by Kepler make up about 70% of those found within the Milky Way. So one can estimate that there are literally tens of billions of potentially habitable planets in our galaxy alone. In the coming years, new missions will be launching, like the James Webb Space Telescope (JWST) and the Transitting Exoplanet Survey Satellite (TESS). These missions will be able to detect smaller planets orbiting fainter stars, and maybe even determine if there’s life on any of them. Once these new missions get going, we’ll have better estimates of the size and number of planets that orbit a typical star, and we’ll be able to come up with better estimates of just many planets there are in the galaxy. But until then, the numbers are still encouraging, as they indicate that the chances for extra-terrestrial intelligence are high! We have written many articles about galaxies for Universe Today. Here’s How Many Stars are there in the Milky Way?, How Many Planets are there in the Solar System?, What are Extra-Solar Planets?, Planets Plentiful Around Abundant Red Dwarf Stars, Study Says, Life After Kepler: Upcoming Exoplanet Missions. On the darkest of nights, thousands of stars are sprinkled across the celestial sphere above us. Or, to be exact, there are 9,096 stars observable across the entire sky. Divide that number in half, and there are 4,548 stars (give or take a few) visible from horizon to horizon. But this number excludes the glowing band stretching across the night sky, the Milky Way. It’s the disk of our own galaxy, a system stretching 100,000 light-years across. The naked eye is unable to distinguish individual specks of light, but the Isaac Newton Telescope (INT) on La Palma in the Canary Islands has recently charted 219 million separate stars in this disk alone. For the last 10 years a team of astronomers led by Geert Barentsen from the University of Hertfordshire has been collecting and compiling light from all stars brighter than 20th magnitude, or one million times fainter than the human eye can see (at 6th magnitude). They created a beautiful density map of the Milky Way, giving them new insight into the structure of this vast system. The black, fog-like regions are galactic dust, which blocks more distant light. The brighter regions are densely packed stars. The INT took measurements in two broad filters, which captured light at the red end of the visible spectrum, and in one narrow filter, which captured light only from the hydrogen emission line, H-alpha. The inclusion of H-alpha enables exquisite mapping of nebulae, glowing clouds of hydrogen gas. The production of the catalogue is an example of modern astronomy’s exploitation of “big data.” But it would also grace the walls of any art studio.